Tisa Chang is Artistic Producing Director of Pan Asian Repertory Theatre. She has lived on the Upper West Side since she emigrated from China at as a child with her mother and career diplomat father. She now lives in the family apartment with her son. She trained in piano, ballet and Chinese dance, majored in music at Performing Arts High School, acted with Uta Hagen at the HB Studio, and earned a scholarship at Martha Graham School of Dance. She also attended Barnard College. Tisa segued to directing at LaMama for Ellen Stewart before founding Pan Asian Repertory Theatre in 1977. She established the theater in order to promote opportunities and access for Asian-American artists. The company is regarded as a pioneer and ground-breaker in the professional American theater arena. You can find details at the Pan Asian Rep website. Pan Asian has won Obies as well as awards from Theatre World, Mayors Koch, Giuliani, and Bloomberg, and many community groups. Tisa is active in public service and has served on panels for the National Endowment for the Arts, The New York State Council on the Arts, the Division of Cultural Affairs, The United States Information Agency, and the Fulbright Program. Although our next inductee, Phyllis Gluck, didn’t spend her formative years on our blocks, she has enjoyed an equally illustrious career in the arts. As a teenager in Queens, she was determined to pursue an education in the arts, earning herself a place studying painting at the Educational Alliance on the Lower East Side and traveling there by trolley, and being accepted not once, but twice into Music and Art High School. A serious injury prevented her from enrolling the first time around. She won a scholarship to the Chicago Art Institute, but instead opted to study at Queens College. She won a Fulbright scholarship to study art in Italy, then came back to New York to complete a master’s degree in fine art, first at City College then at Columbia University. 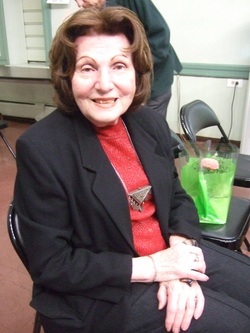 Phyllis taught at Teacher’s College before becoming a professor, a department chair and a dean at Brooklyn College. As a professor emeritus, she continues to mentor the occasional student. Phyllis met her husband Samuel, who was a mining engineer, when they were both students at Columbia. They raised their three sons, including a pair of twins, moving south from W. 107th St. to 103rd when they needed more space. All three have achieved successful careers in the arts, one as a sound engineer, one as an organ builder, which he’d identified as his goal when he was but a young child, and one as a movie director. Two of her children have remained here in New York City; one has made a life on the west coast. She’s a proud mom and grandmother of twins. Phyllis identifies one of the biggest differences in her building as the change in the population of residents. As apartments turn over, she observed, the new residents seem to be people from abroad who are staying for relatively short periods rather than putting down roots as she did. Phyllis will be celebrating a milestone birthday later this month. Please join me in wishing her many happy returns as we celebrate her longevity on our blocks. Peter Juviler made a much longer trip in order to wind up on our blocks. He moved to New York from England with his family as a young man. He earned his undergraduate degree from Yale, served in the Navy, and pursued his interest in world politics by completing his doctorate at Columbia. He also attended Columbia’s Harriman Institute for Russian, Eurasian and Eastern European Studies and is on the faculty there. For many years he was a much-in-demand professor of political science at Barnard College and is now Professor Emeritus. He is co-editor of Non-State Actors in the Human Rights Universe, which examines a broad range of non-state actors engaged in various activities that violate, promote, or protect human rights, and is the author of several books, including Freedom's Ordeal: The Struggle for Human Rights and Democracy in Post-Soviet States, which recounts the struggles of the15 newly independent nations that resulted from the collapse of the Soviet Union to achieve freedom and to establish support for fundamental human rights. Peter’s presence in our neighborhood was the result, as is so often the case in real-estate transactions, of being in the right place at the right time. A contract on what has been his apartment for so many years had fallen through just before he came to see it. He raised his two sons Geoffrey and Gregory on our blocks and is “very grateful that I’ve spent these years here.” Peter’s sons have since moved north and west and given him five grandchildren while he’s stayed put with his wife Anne Stephens, to whom was introduced by mutual friends at a party in the 1980s. They enjoy visiting the Roerich Museum on 107th Street, especially when there’s a free chamber music concert on the schedule, and taking long walks in Riverside Park. They both agree that the evolution of Riverside Park over the years has been a striking change in the neighborhood and describe it as “a fabulous resource right outside the window.” With only 30 years under her belt, Anne will have to wait a bit for her own induction into our Residents of Long-standing Hall of Fame, but we’d nonetheless like to officially, if belatedly, welcome her to the neighborhood. Peter passed away on May 20, 2013.